In the summer of 2015, movie viewers may have become confused about the decade. For one, Straight Outta Compton flashed back to the late 1980s/early 1990s. Given its lead character’s fashion preferences, Dope seems to revisit roughly the same era, but instead, it takes place in the current time. Dope focuses on Malcolm Adekanbi (Shameik Moore), a high school senior who aspires to attend Harvard. Obsessed with early 90s styles and music, other kids view the brainy Malcolm as a geek; his friends Jib (Tony Rrvolori) and Diggy (Kiersey Clemons) share his fascination, but they’re also thought of as nerds. That’d be bad enough at a typical high school, but Malcolm and his pals run into more trouble due to their neighborhood. They live in “The Bottoms”, a rough, crime-ridden LA suburb. We follow Malcolm’s path as he runs into a mix of challenges. That synopsis makes Dope sound a whole lot more serious than it is. While it comes with a rough edge, Dope offers something much more in line with a “coming of age” comedy/adventure such as Superbad than a dark drama like Boyz N the Hood. That’s an interesting choice, but not one that I’m sure succeeds. On one hand, I like the way the movie offers an acerbic take on the usual “hood” genre. It actually adopts a Tarantino vibe, as it jumps around and plays with us in a manner that seems to come from QT’s playbook. This means Dope can be entertaining, but the tone can feel off-putting. This seems most obvious early in the movie, mainly via the way the film makes comedy out of an unfortunate killing. Part of me appreciates the dark humor involved, but the casual/glib way in which the film treats tragedy can be disconcerting. The tone becomes less of an issue before long, but Dope remains inconsistent. Frankly, there’s not a lot of narrative coherence on display here, as the movie leaps from scenario to scenario without a ton of logic. Granted, the nature of the tale suits that approach to a degree, but the story still comes across as rather random. Despite that, Dope tends to be fairly entertaining much of the time. As I mentioned, the playful manner in which it treats the standard “life in the hood is hard” offers something different – until the end, at least. I don’t want to provide spoilers, but the film turns more serious at the finale, and I’m not sure that this fits. Actually, probably the biggest issue with Dope stems from its rampant appropriation of different films. While I previously alluded to it as “Superbad Meets Boyz N the Hood, the movie really borrows from a wide variety of sources, so many that I occasionally wanted to change my description. For instance, the ending comes straight out of Breakfast Club. Scads of other cinematic allusions abound, and that means Dope never establishes a firm identity of its own. Nonetheless, it provides reasonable entertainment value, especially as it becomes “High School Ocean’s 11 - hey, there’s another influence! Even with its inconsistencies and odd dalliances, the tale stays engaging, partly due to the likable cast. In particular, Moore helps hold together the melange of elements, as he creates a convincing and successful protagonist. I’d like to be more effusive in my praise for Dope, as I appreciate its attempt to do something different. It just doesn’t succeed on a consistent basis. While the movie comes with plenty of positives, it falters too much to be as good as I’d like. Dope appears in an aspect ratio of approximately 2.40:1 on this Blu-ray Disc. I found no problems with this excellent presentation. In terms of palette, the movie favored a mix of teal and amber. Brighter hues looked good, and overall color balance appeared positive. Blacks were dark and tight, while shadows showed nice clarity. Sharpness excelled. All shots – wide, close and in-between – provided solid clarity and definition. If any softness emerged, I didn’t see it. Jaggies and shimmering were absent, and edge haloes weren’t a factor. No signs of source flaws emerged, and I didn’t sense any digital noise reduction; the film featured good natural grain. Across the board, this was a pleasing transfer. Character films don’t usually boast dynamic audio, so don’t expect much from the DTS-HD MA 5.1 soundtrack of Dope. The soundfield remained pretty limited through most of the film. Music showed nice stereo presence, and a few scenes – usually those in clubs - opened up the environment in a reasonably satisfying manner. A few action/violent scenes added a little pep, but those remained fairly infrequent. Audio quality was solid. Speech always came across as natural and distinctive, with no signs of edginess or reediness. Music sounded lush and warm, while effects – as minor as they were – appeared accurate enough. Nothing about the track dazzled, but it suited the film. The Blu-ray includes two featurettes. 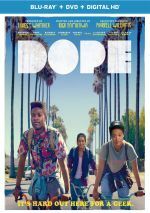 Dope Is Different runs three minutes, 21 seconds and offers notes from director/writer/executive producer Rick Famuyiwa, executive producer Pharrell Williams, producer/narrator Forest Whitaker, and actors Shameik Moore, Kiersey Clemons, A$AP Rocky, Chanel Iman, and Tony Revolori. “Different” offers a general overview of characters, story and themes. It’s a basic promo piece. Dope Music lasts three minutes, 29 seconds and features Williams, Famuyiwa, Rocky, Clemons, Moore, Whitaker and co-producer Mimi Valdes. This one looks at the songs in the movie. Like “Different”, it does little more than advertise the film. The disc opens with ads for Rock the Kasbah, The Man With the Iron Fists 2, Trainwreck and Ted 2. Previews adds promos for Straight Outta Compton, Furious 7, Pitch Perfect 2, Brooklyn Nine-Nine, The Fluffy Movie, A Haunted House, A Haunted House 2 and Chef. No trailer for Dope shows up here. 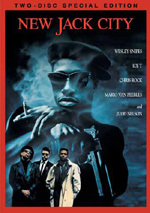 A second disc provides a DVD copy of Dope. It includes the same extras as the Blu-ray. An unusual take on the “coming of age” genre, Dope seems too erratic to fully satisfy. Still, it entertains much of the time and offers enough charm to keep us with it. The Blu-ray boasts excellent visuals and pretty positive audio but lacks notable supplements. Dope shows enough promise to be worth a look.